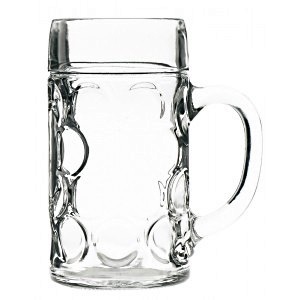 Beer Stein (or Stein) is really an English term. In Germany the term 'Stein' means 'made out of stone' not the usual glass beer glass we think of. In German, "Stein" is an abbreviation of Steinzeug - translated literally as 'stoneware' hence one sees many of this variety at car boots (in the UK) -stone - not glass hinged-beer glasses. They tend to be a tad smaller than the glass versions. Having been to Germany (and specifically to Oktoberfest) on many ocassions, they look puzzled and bewildered at the word 'Stein' for a beer glass. Their term for a (beer) stein is Krug or Steinkrug. Bierstein - the literal translation being 'beer stone' - nothing to do with a beer stein glass.